Just wanted to start off with the fact that I’m really sad that this is my last tea that I’m review from my cross-border tea shopping haul that happened back in September. I’m pretty sure this just means that I need to go shopping again (right?). I picked Trader Joe’s Earl Grey because I love Earl Grey, and I like to judge tea companies based on the quality of their Earl Grey blends. Earl Grey came in a cardstock box, holding 20 tea sachets. Each tea sachet is individually wrapped in a foil packet – so bad for the environment! 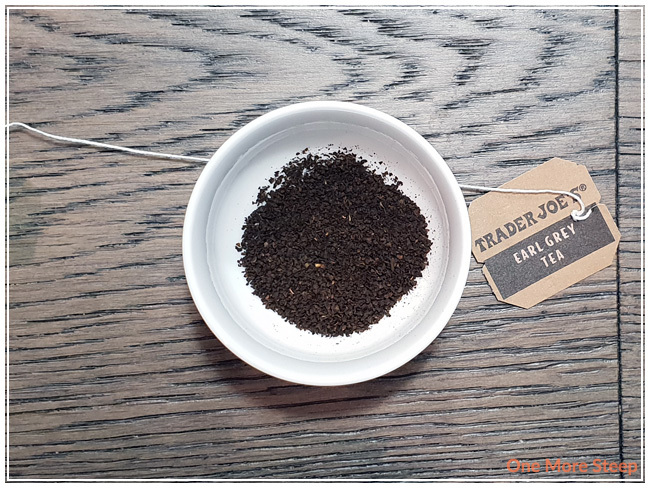 However, unlike the last Trader Joe’s tea that I reviewed, there weren’t any staples holding the tag to the string or the string to the bag – so there’s that, at least? The tea bag material is slightly stained yellow on multiple bags, so I suspect that it’s due to the bergamot oil. The aroma of Earl Grey is primarily the bergamot, such a nice rich citrus flavour! The black tea base isn’t as strong compared to the bergamot, but I can smell it. It reminds me a lot of an Assam black tea with its rich malty notes. 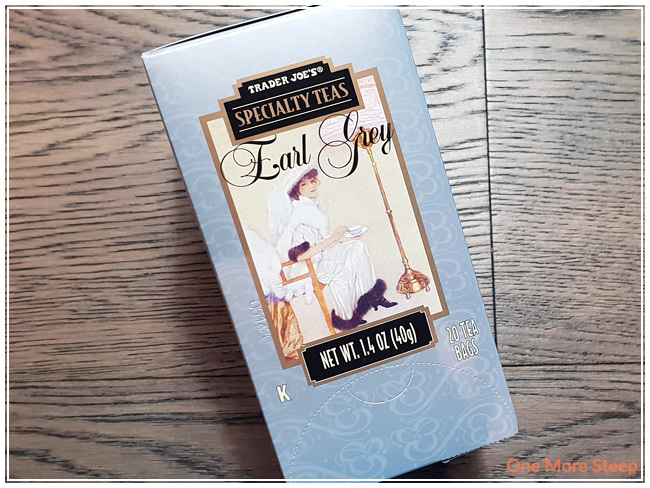 Earl Grey consists of: black tea and bergamot oil. Trader Joe’s recommends steeping Earl Grey in boiling water (100°C/212°F) for 3 to 5 minutes. My initial steep was for 5 minutes. 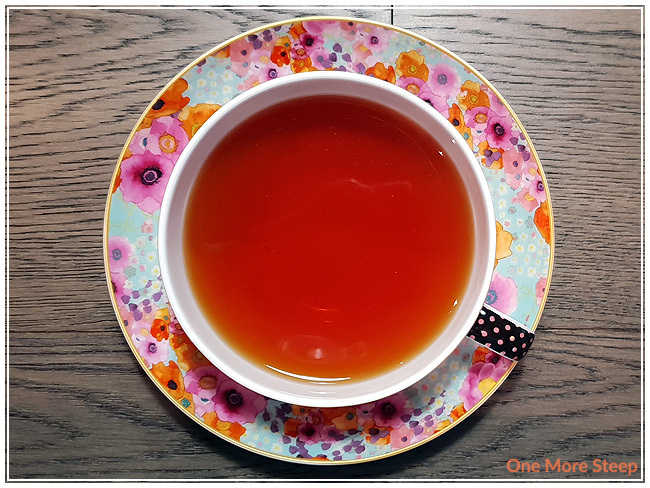 Earl Grey steeps to a deep reddish orange. The aroma of bergamot is strong in the steeped tea. On first taste, all I can taste is bitterness, the tea is very astringent. 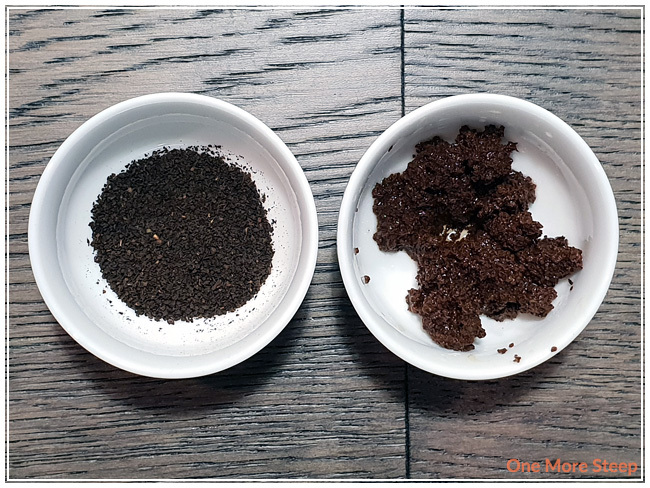 I did another initial resteep, this time at 3 minutes, and found that tea was more drinkable. I could taste the bergamot, and the malty notes from the black tea play well with the citrus flavours. At 3 minutes, I found no bitterness or astringency. I attempted to resteep Earl Grey and found the flavour to be severely lacking. I would say that Earl Grey is good for just one steep. 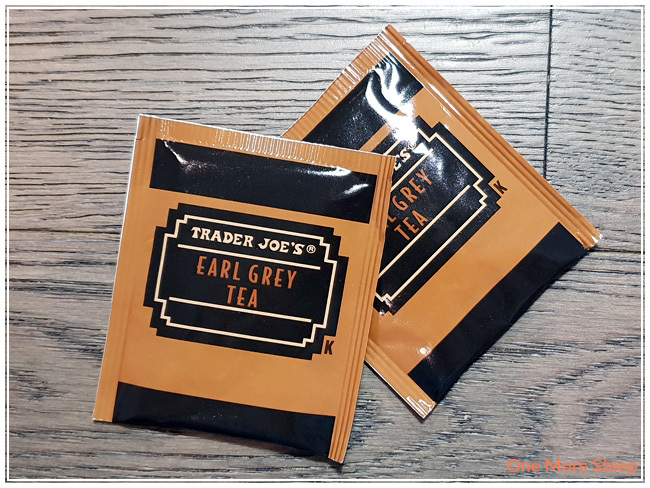 I thought that Trader Joe’s Earl Grey was just okay. Part of my problem with this tea is the packaging that can’t be composted or recycled (those foil-lined packets! ), and that the tea was pretty terrible when steeped for 5 minutes (which is part of the recommended steeping times). However, Earl Grey did redeem itself when I did an initial steep for 3 minutes. 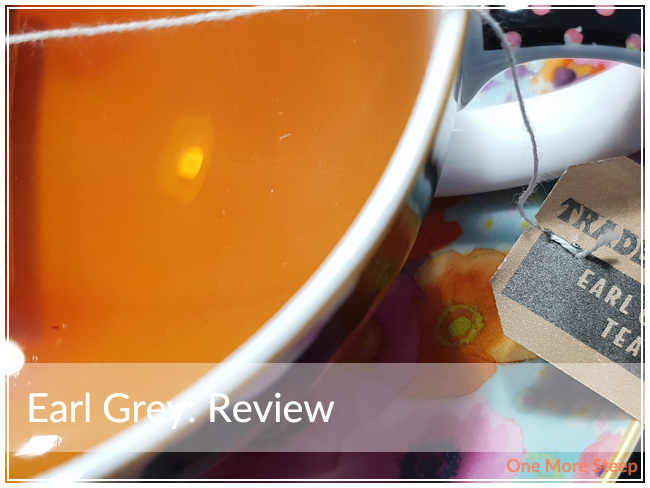 The flavours were well-balanced, and it made for a decent cup of Earl Grey. That said, there are a lot of Earl Grey options out there that have less packaging (or more recyclable/compostable packaging). The flavour is on point for an Earl Grey, but it just doesn’t excite me as much as other bergamot black tea blends do.